Now that Raymond and I are reasonably well-ensconced at the Manse, in tiny Queensborough, people ask us (fairly frequently) whether we miss Montreal, our jobs at the Montreal Gazette, urban life in general. I can’t and won’t speak for Raymond; as for me, my answer is invariably: “Not at all.” I feel so fortunate – actually “blessed” is the right word – to be back in the interesting, beautiful, out-of-the-way place that I was lucky enough (I hit the jackpot on that one) to grow up in; and not just that, to be in the very house that I grew up in, a happy house that I am convinced is happy in turn to have us back there. And I am blessed to have a wonderful and challenging job in the area. And a husband (Raymond) who is open to new stuff and new challenges. This evening Raymond and I drove by Montreal, without even stopping at the home we still have there, on our way to the Eastern Townships of Quebec and a visit with Raymond’s just-over-six-months-old grandson Henry (and Henry’s parents, of course). And even while, as we drove past Montreal, I was starting to feel a bit homesick for our Manse (which was silly, since by the time you read this we will probably be back there, or very close to it), I also looked at the familiar downtown skyline of the city I know so well and felt – what? Homesick? No. (That’s Manse territory.) Sad? A bit. Nostalgic? Yes. Can you ever leave an important part of your life behind without feeling sad? Surely not. My sadness when my family moved from the Manse, way back in 1975, was apparently so profound that I felt compelled, all these years later, to buy the house when the opportunity arose and move back, changing my whole life (and Raymond’s) into the bargain. And I am not a bit sorry for it; I have been happy every moment that I have been back at the Manse. I think it was meant to be. But how can you spend 16 years of your life in a great (though frequently frustrating) city and not miss it when you leave? I felt that same tug a few weeks ago, when I took the train from Belleville, Ont. (where I work) to Montreal, to meet up with Raymond, who’d been there for a couple of days, for some joint mission or other that we had in the city (I’ve already forgotten what it was) before we returned home to our happy Manse. I’ve taken the train from Ontario (where all my family lives) to Montreal many, many times through my 16 years living there, and what happened on that recent return was the same thing that had happened every time before: just before pulling into Montreal’s Central Station, you see the iconic Five Roses neon sign (atop what I guess is the old flour mill where Five Roses flour used to be made, and perhaps still is), and you remember all over again what a funky and great place Montreal is. 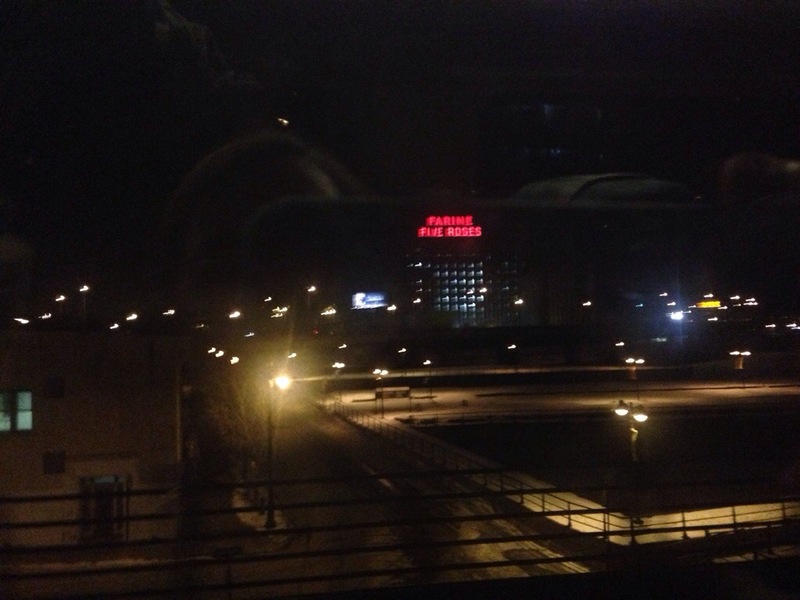 The fuzzy photo that you see atop this post is my attempt on that train return a few weeks ago to capture, while I still had one last chance, that Five Roses moment (through the window of the train) that had brought me joy on so many returns to Montreal over the years. All of which is a very roundabout way of saying something that I am sure all of you reading this already know: that you cannot ever leave a place that has meant a lot to you without feeling sadness. Even as you find new happiness in each day of life in a new place. Or, in my case, an old place. Why oh why didn’t I buy that telephone table? 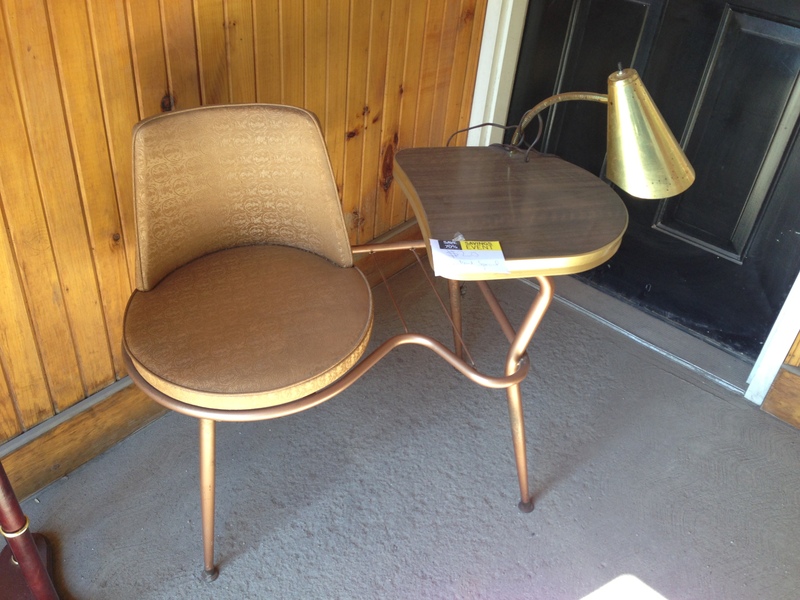 A little less than a year ago, I made a decision – a poor decision, as it turned out – not to snap up this vintage telephone table that was for sale at a shop called Kim’s Kollectibles in Madoc. “Too kitsch,” thought oh-so-sophisticated me. Kitsch? Try useful! What was I thinking? Not for the first time, I am going to remind all you good readers – and myself at the same time – that when you see something you like, for goodness sakes buy it. Because if you don’t you’ll regret it. I know the eternal truth of this maxim perfectly well, and yet I keep stupidly failing to follow it. Case in point: the telephone table. Maybe longtime readers will recall this post, in which I wondered aloud whether Raymond and I had erred in resisting the temptation to buy a vintage (early ’60s, maybe?) 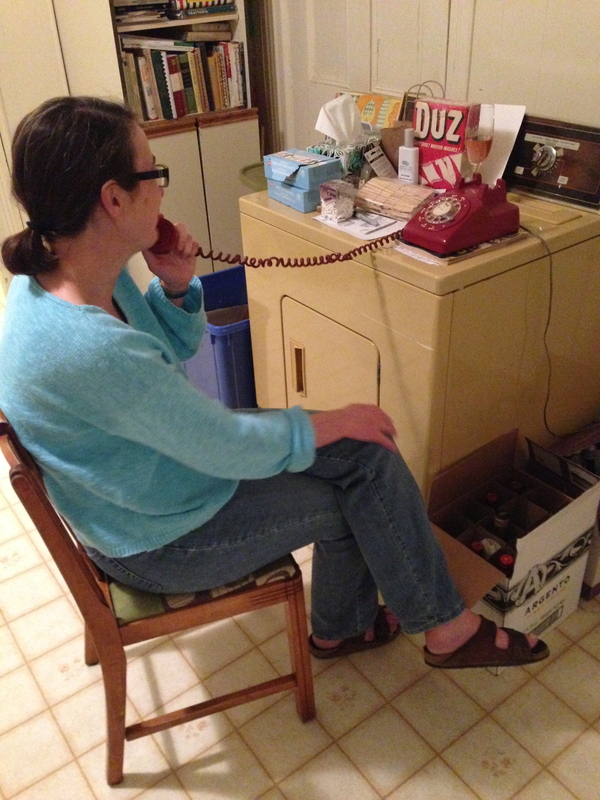 telephone table that was on offer at Kim’s Kollectibles in Madoc – the one that you see at the top of today’s post. I loved what a period piece it was (i.e. the period of my childhood here at the Manse, when many homes – though not ours – boasted such a convenience), but I told myself (as did Raymond) that there was no room for it in the Manse’s kitchen, that it was a little too kitschy, etc. etc. It was on offer from an outfit called Du Design, Du Retro et du Kitsch, a store on Sainte Catherine Street East in Montreal that I discovered (via its Facebook page) thanks to Raymond’s daughter Dominique, who has excellent taste and a liking for vintage. 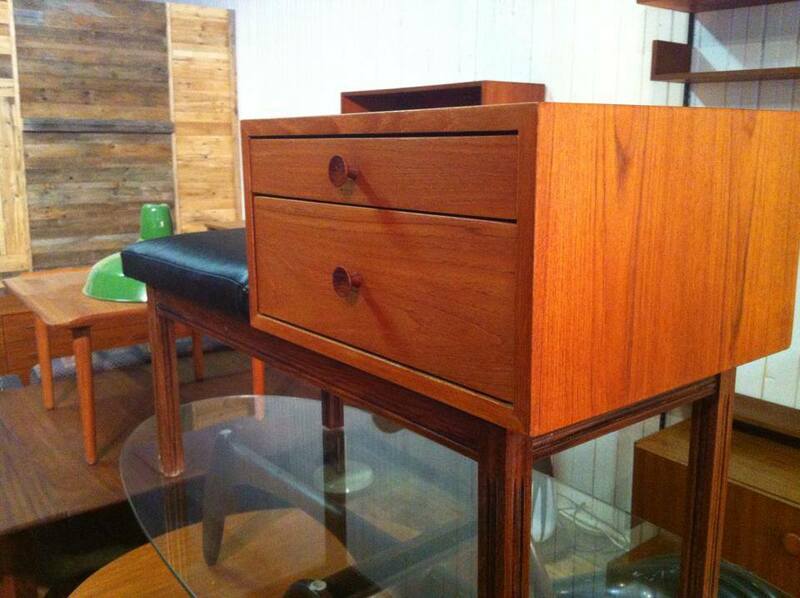 It was made of teak, beautifully restored, and was $250. I thought about it, but not hard enough and not quickly enough; it was snapped up just a little over an hour after the photo was posted. So I am still telephone-table-free. But I would like to think that, having let not one but two such beauties slip by, I will not make the same mistake again. Stay tuned. 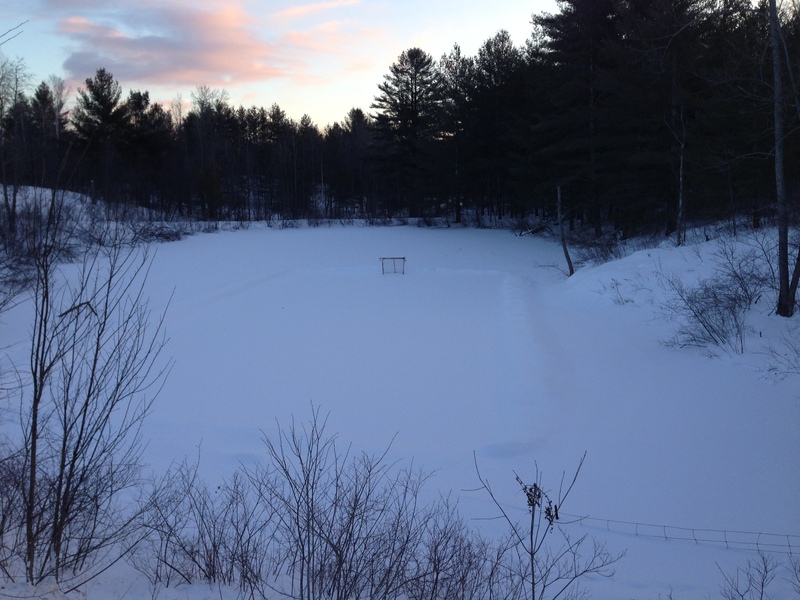 Down our road: as the morning sun rises, a homemade outdoor hockey rink awaits its next skaters. If you look closely you might be able to see the hockey sticks parked atop the net. This has been some winter, let me tell you. Or at least, if you live in Southern Ontario, especially anywhere near the shore of Lake Ontario, I don’t have to tell you; you know perfectly well about the ice storm and the bitter cold and the seemingly unending snowfall and the blowing snow, all of which have made our lives rather miserable since well before Christmas, and that show no signs of letting up. Raymond is a little given to looking on the bright side, however. He keeps pointing out how beautiful winter is here in the country, with vast expanses of sparkling white fields, and evergreen trees looking Christmas card-like with their branches laden with white. And he compares it, favourably, to winter in the city, where the snow quickly gets dirty and ugly, and where it’s a trial finding a place to park on your street after a snowfall, and where you then have a monster shovelling-out job after the plow blocks in your car. And where driving around through the slush and/or accumulated snow just makes a person crabby. This winter, our first in full-time residence at the Manse, has certainly brought its challenges – a near-miss with power failure during the ice storm; some challenging commutes to work, as I wrote about here; and shovelling, endless shovelling – but there really is compensation to be had in the beauty that is all around us here in Queensborough and environs. And it isn’t just the beauty of nature that can lift one’s spirits; sometimes the winter work of humans does too. Like the homemade outdoor hockey rink that you can see in the photo atop this post, which Raymond and I admire every time we pass by it on Queensborough Road on our way to or from Tweed. With its well-cleared rectangular surface, the net at the end ready to be scored in, and the two hockey sticks parked atop that net waiting for the next skaters to arrive – all with a backdrop of woods and pristine snow and, this morning when I took the photo, the rising sun just beginning to bring some rose colour to the clouds – it is a happy reminder of the joys of winter. In the country. 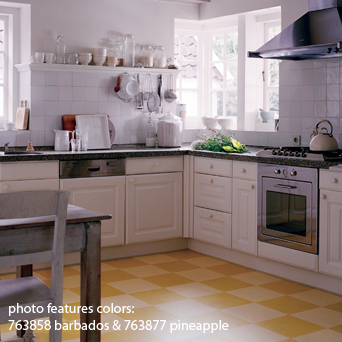 From Kirkcaldy, Scotland, to the Manse kitchen, it’s – linoleum! The town in question has the lovely name Kirkcaldy, and you can read more about it (and its connection to linoleum manufacturing) here and here. Indeed it would have been linseed oil – a key ingredient of linoleum, as I discovered in my research on the subject (reported here). That research also led to the discovery that even though linoleum is very retro, it is extremely environmentally friendly and, perhaps for that reason, is coming back into vogue after being displaced for all those late-20th-century years by wall-to-wall carpeting. 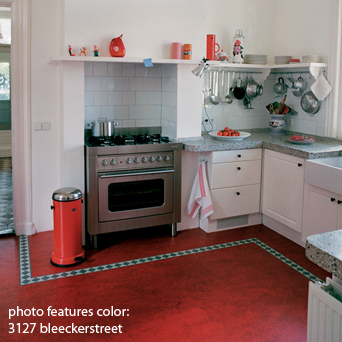 So all the more reason for hanging onto our vintage linoleum carpets – and also, I hope, installing a linoleum floor in our renovated Manse kitchen! And thanks to the tip from our friend, I think I have a line on that, and some cool ideas. I did a bit more poking around on the internet, looking up the company based in Kirkcaldy that is still making linoleum and, according to this BBC site, is one of only three producers in the world. It is called Forbo-Nairn (one Michael Nairn having been the founder of the operation in Kirkcaldy), but it’s mostly just shortened to Forbo in its marketing efforts, as far as I can see. And this company has lovely linoleum flooring. Look! Linoleum-floor ideas photos and a Scottish poem: thank you, Elizabeth! What the deuce ever happened to snow fences? Today was a thoroughly awful winter-weather day – particularly awful if one had to drive in it, which I did. Now, I was well-taught about winter driving by my father, who was a very good driver. What I learned from him was simple but effective: drive slowly and carefully, have snow tires on your car, and be constantly aware that any other driver on the road may do something dumb or lose control of his/her vehicle at any moment. Those rules have stood me in very good stead through all manner of poor driving conditions, and it therefore takes a lot to scare me about winter driving. But today scared me. The problem was blowing snow: it has snowed an enormous amount lately, including through the night last night, and this morning’s high winds were blowing snow all over the road. On my southerly drive to Belleville from the Manse in Queensborough, down normally well-maintained Highway 62, there were some really scary whiteout conditions combined with patches of quite deep snow on the blacktop. Nasty nasty nasty. As I grimly made my way through it (safely, I am happy to add), I found myself wondering this: What on earth ever became of snow fences? 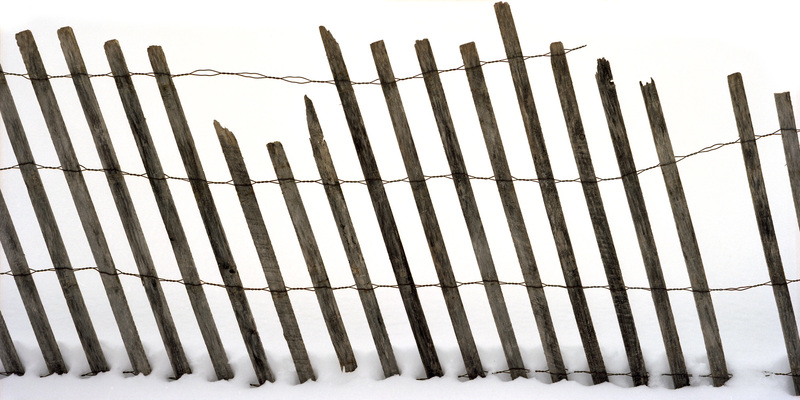 When I was a kid growing up at the Manse, you saw snow fencing everywhere: it ran parallel to the roadway, maybe 10 or 20 feet inside the regular fenceline, in all the farm fields. As I understand it, the role of this fencing (which I believe was removed once winter ended) was to prevent, or at least ameliorate, the miserable road conditions that I and many others endured today. It wasn’t what you’d call attractive, that snow fencing – in fact I recall thinking, as a kid looking out the bus windows on the way to and from school, that it was particularly unattractive – but if it helped keep snow off the roads, what matter? So why doesn’t anybody use snow fencing anymore? The problem areas on Highway 62 this morning were along sections where there were wide open farm fields alongside the highway, and the snow whipping unimpeded across those fields and into the pathway of the vehicles was quite something to see – impressive, if you didn’t have to deal with the fallout from behind the wheel. Doubtless it was a pain in the neck for farmers to put the snow fence out every fall and take it in again in the spring. But they did it, God bless them. Why not now? Were there once regulations requiring it that are no longer in place? What’s the story here, people? I know that at least some of you must know. Please share! 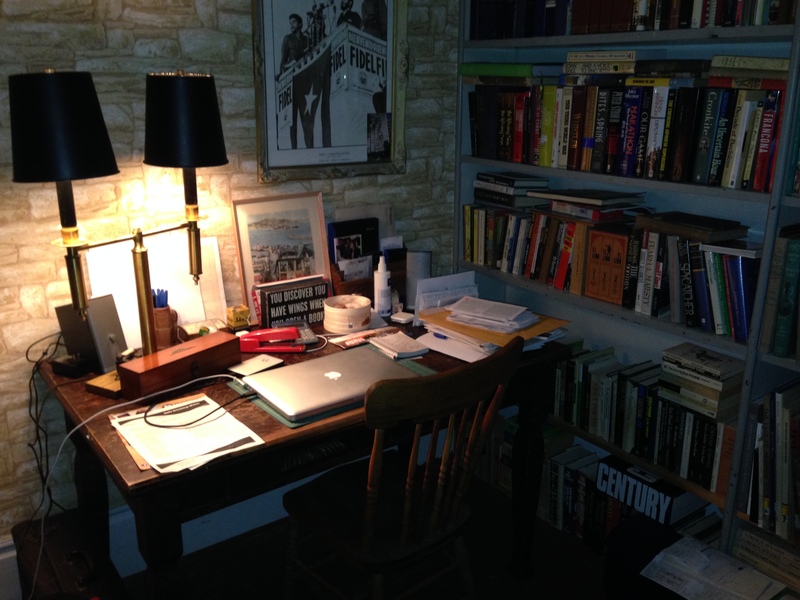 The desk in the Manse’s study where my father – and for all I know, where his predecessor The Rev. 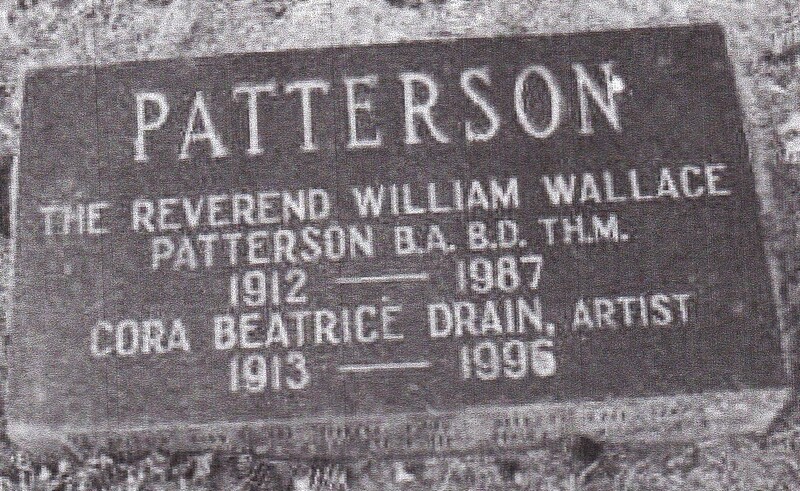 W.W. Patterson – wrote sermons on Saturday nights. On this particular January Saturday night (when this photo was taken), it looks as warm and cozy (and book-filled) as it did back then. The laptop is, if course, a new addition to the decor. A week ago I wrote a post paying tribute to readers who share their knowledge – information that they just have, or have dug up – about subjects I touch on here at Meanwhile, at the Manse. Over the almost two years I’ve been doing this blog, you folks have shared all manner of general and historical knowledge, photos, videos, documents, website links – and maybe best of all, your memories of Queensborough. Well, since that post, readers have sent me still more great stuff! 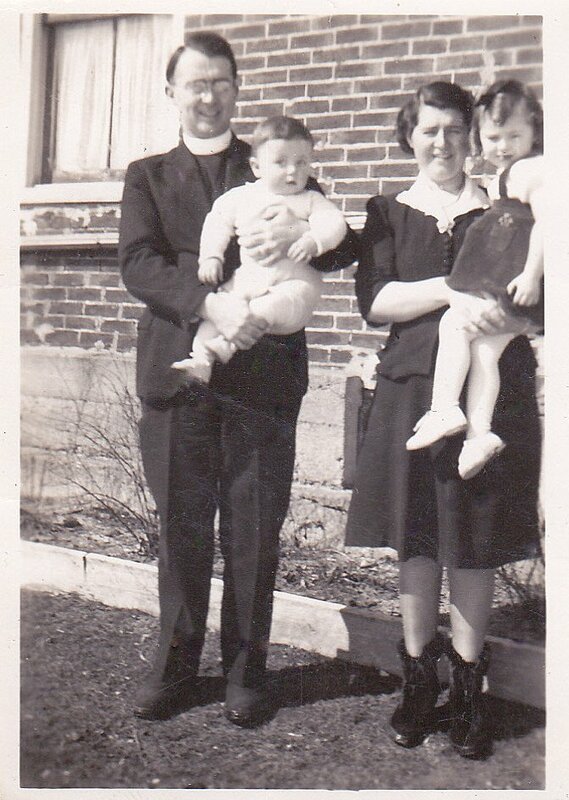 And interestingly, the spark for most of it is once again the story I told here (thanks to yet another reader-supplied photo) of a minister’s family that lived here, in what is now our Manse, back in the 1940s: the family of The Rev. W.W. Patterson. It is obvious that, even though it’s been many years since the Pattersons’ time in Queensborough, they are very fondly thought of by all who remember those days, and all manner of interesting information (including more photos, like here) has come in about them. Thank you! One that I particularly liked, and that strikes a chord with me on this wintry Saturday night at the Manse, is a history of another church that The Rev. Patterson served at, discovered by reader Ruthanne (who also grew up in Queensborough, and whom I had the pleasure of meeting last August at the annual summer service at historic Hazzard’s Corners church). The historical sketch that Ruthanne found tells us about this new and growing and enthusiastic congregation raising the money to build a church building and to purchase a home to serve as the manse for their minister and his family – wife Cora and their children, who by this time numbered five. (There were only two children when the Pattersons lived here at the Manse.) Construction of the church took place in 1960, and the first service was held there in December of that year. The Sunday School reached its peak in 1965. There was an enrolment of 450. Teachers and staff numbered 39. Hi-C! CGIT! (That’s “Canadian Girls in Training” for you uninitiated folk. It was a United Church program for girls. And Hi-C was a church group for teenagers.) And a Sunday School of 450 children! My goodness, those were the days. Most Protestant churches that I know today are happy if they can round up half a dozen kids on any given Sunday for Sunday School. Anyway, on a January Saturday night here at the Manse, this has got me feeling nostalgic. Why Saturday night? Because when I was growing up in this house and my father, The Rev. Wendell Sedgwick, was the minister at St. Andrew’s, Saturday night after supper was a busy, busy time in this old house. We four kids all had to have baths in preparation for church the next morning; my mum, Lorna (Cora Patterson’s successor), would be ironing Dad’s suit; there would of course be Hockey Night in Canada on our old black-and-white TV; and my father would be hard at work in his study upstairs, putting together his sermon for the next morning, taking a break only to come down and feed the wood stove in the kitchen as needed to keep the house toasty on cold winter nights such as this. Those memories are extraordinarily happy ones. And they come from the same era as when St. Matthew’s United Church was just starting out, when it had so many youth groups and women’s activities and choirs and fundraising and a huge Sunday School, and when the future for it, and for churches as a whole, looked bright. There are many of us church-going folks who feel the future is still bright, though it is likely to be a very different future than the one my father as a young minister envisioned as he wrote his sermons in the Manse study on a Saturday night, or that the young and growing congregation of St. Matthew’s United Church (led by The Rev. W.W. Patterson) foresaw back in the early and mid-1960s. And that’s probably a discussion for another Saturday night at the Manse. On this Saturday night, though, I am enjoying a look back into my own past, and that of my church. And for that I have, as I so often do, a generous reader to thank. 20 inescapable songs! 20 original artists! Friday night at the Manse: a fire in the fireplace (electric, but who cares? 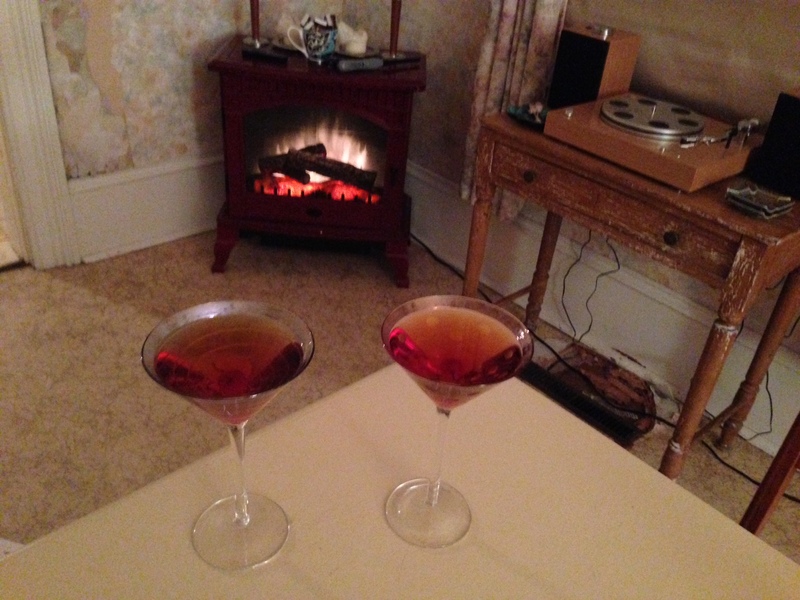 ), Manhattans, and a turntable for some classic vinyl records: what more do you need for a perfect Friday night, save for Katherine’s list of the Top 20 ubiquitous songs from when all of us were young? If you are, like me, of a certain age, you have doubtless caught on to the reference in the headline of this post. How can we forget the TV ads of our youth for those cheap K-Tel albums that regurgitated (in truncated form, something that K-Tel never mentioned in its ads) the hits we’d just been hearing on the radio? But this is not just about K-Tel, my friends. Oh no. This is Friday night – best night of the week; I don’t have to get up at 6 a.m. tomorrow for work! – and so, like last Friday night, we are going to have some fun with music. However, there is a difference. Last week I wrote about the songs that, in the long-ago years (the 1960s and early ’70s) when I was growing up here at the Manse, every MOR (that’s middle-of-the-road for you young folk) singer worth his or her salt felt he or she needed to sing on those ubiquitous TV variety shows. Songs like (Life is a) Cabaret, and People (Who Need People), and of course, of course, the ultimate everybody-sang-it song, The Impossible Dream. On this Friday night we are going to try something a bit different, and possibly a bit more fun. Tonight it’s about ubiquitous songs that weren’t sung by every singer under the sun – that instead gained their ubiquity while being inextricably identified with their original singer (or band). These are the songs that were utterly, utterly inescapable once upon a time; you could not turn on a radio without hearing them. Remember? Of course you do! Anyway, here are my Top 20 inescapable songs, starting at #20 and working up to #1. Some of them are songs I think are eternal classics; some are godawful and really should never have happened in the first place. But they all share the distinction of having been ubiquitous in The Manse Years. However! Before we start, I have something important to say: I want you to join in on this musical project! What glaring errors or omissions are there in my list of ubiquity? How would you order a top-20 lineup of inescapable ’60s and ’70s songs if you were doing it? What have I put on the list that doesn’t belong? What’s missing? Think about it, and please share your thoughts. But for now, sit back, enjoy the fact that it’s Friday night, and – let’s take a trip back through some pop-music history. And now we’re into the Top 10 of ubiquity! How exciting! Okay, here’s #10, and what more appropriate to take us into the 1960s/’70s Top 10 than – the Age of Aquarius?